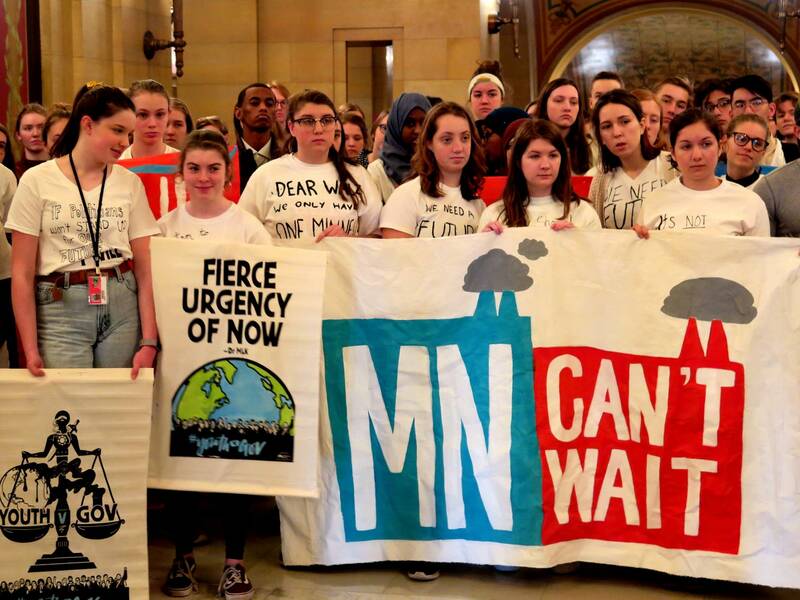 A group of passionate Minnesota teenagers hopes 2019 will be the year state government gets serious about climate change. Dozens of high school students from across the state packed the governor's office for a meeting Wednesday, urging Gov. Tim Walz, Lt. Gov. Peggy Flanagan and Minnesota Pollution Control Agency Commissioner Laura Bishop to action. "Once we raise temperatures by more than 1.5 degrees Celsius, there's no turning back," said Minneapolis South High School sophomore Isra Hirsi, citing the findings of the United Nations' climate change panel. "That means we have 11 years to fix this. Eleven." Thirteen-year-old Olya Wright, of Grand Marais, lamented what's happening with winter sports like dogsled racing. "Minnesota is known for our cold, long winters. This brisk and snow-filled season is something we are already losing to climate change," she said. "Minnesota can't wait. We need to act. Now." 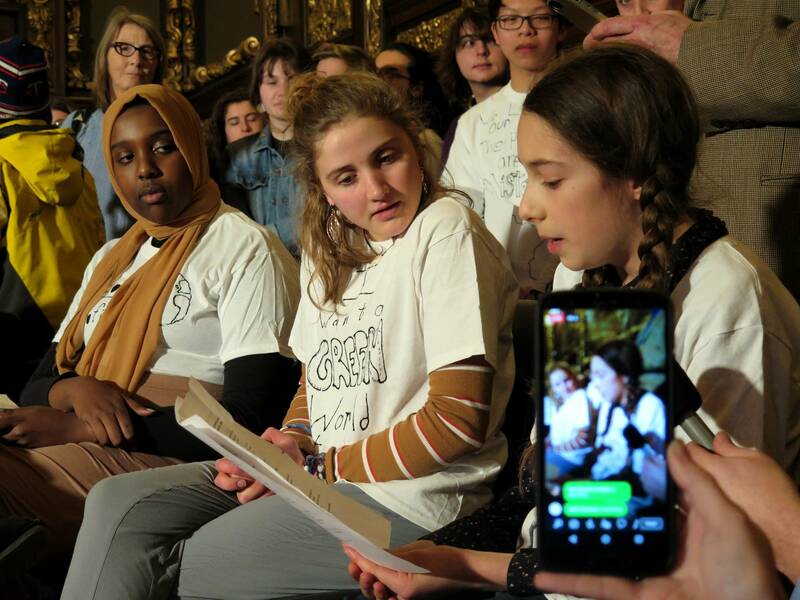 The teenagers brought with them three specific proposals for the new administration: They want Walz to issue an executive order to regulate greenhouse gas emissions within the state. They want his administration to follow through on a legal challenge to the Line 3 replacement oil pipeline the Dayton administration started. And they want lawmakers to pass legislation to put Minnesota on a path toward 100-percent renewable energy. Minnesota doesn't regulate greenhouse gas emissions, but set goals for reducing emissions a decade ago — goals it hasn't been able to meet so far. The Line 3 oil pipeline replacement project planned for northern Minnesota, is working its way through the regulatory process. The Minnesota Public Utilities Commission approved the project's plan and route last year. With only a handful of state approvals until Enbridge Energy can begin construction, it will be up to the Walz administration to decide whether to continue to pursue legal action filed by the previous administration that could halt the project's forward motion. On Thursday, business groups, labor unions and others delivered a letter to Gov. Walz asking him to reverse former Gov. Dayton's policy and withdraw the state's challenge to Line 3. Pipeline opponents see the project as furthering our dependence on the fossil fuels that contribute to climate change. And the state already has a mandate to make 25 percent of its electricity renewable by 2025, so the students' proposal for moving that target to 100 percent would be a significant change. Walz told the group Wednesday that he, too, thinks that the state urgently needs to act on climate change. But he reminded the teens that not everyone in the state agrees. "We ran unabashedly that climate change will kill the planet and stop our future," he said. "We must act boldly and move forward on that. We said that, and a million people voted against us." Neither Walz nor Flanagan committed to specific policies at Wednesday's meeting with the students, but Walz said he sees signs that more elected officials than ever are willing to address climate change. "We're at that tipping point. It's close, we're hopeful, we're optimistic, it's becoming much more crucial to move quickly," he said. But the teens made clear they won't be letting state leaders off the hook. Edina student Maddy Fernands, who emailed Bishop on her first day at the state Pollution Control Agency, asked Walz how she and her peers could keep things moving. "What can we do to follow up with all of you on this? Because we want to make sure that this is going to happen," she said. There was some talk about getting in touch with schedulers and about attending future events. Then, an 18-year-old from Mankato who had been standing in the back stepped forward through the crowd: It was the governor's daughter, Hope Walz. "I was going to ask," she said, "How I can get involved with the group?" The interruption brought an already excited room full of teenagers to a fever pitch. 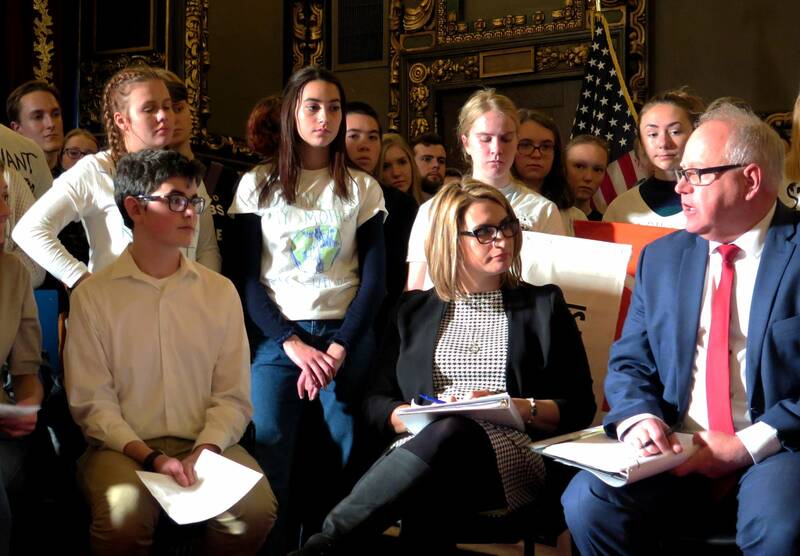 The teens said they'll be back at the Capitol soon to introduce a DFL-sponsored bill aiming for 100-percent renewable energy.